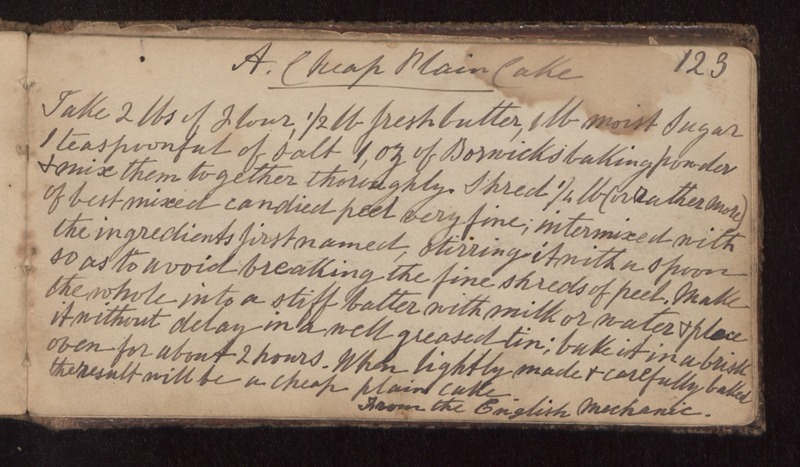 A Cheap Plain Cake 123 Take 2 lbs of Flour, 1/2 lb fresh butter, 1 lb moist sugar 1 teaspoonful of salt 1 oz of Borwick's baking powder + mix them together thoroughly. Shred 1/4 lb (or rather more) of best mixed candied peel very fine; intermixed with the ingredients first named, stirring it with a spoon so as to avoid breathing the fine shreds of peel. Make the whole into a stiff batter with milk or water + place it without delay in a well greased tin; bake it in a brisk oven for about 2 hours. When lightly made + carefully baked the result will be a cheap plain cake. From the English Mechanic.